New Delhi [India], Nov. 15 : Israel President Reuven Rivlin, who arrived here yesterday on an eight-day official visit to India, will hold bilateral talks with Prime Minister Narendra Modi on Tuesday - the focus of which is likely to be on agricultural cooperation between the two sides. India and Israel enjoy excellent relations marked by strong ties in the areas of economy and commerce, science and technology, research and innovation, culture and tourism, education etc. During his visit from November 14-21, President Rivlin will be meeting his Indian counterpart Pranab Mukherjee, who will also host a banquet in his honour. Later, Vice President Mohammad Hamid Ansari and External Affairs Minister Sushma Swaraj will call on the visiting dignitary. US Agriculture officials recently approved new method to kill poultry infected by bird. The officials said under the new method, the infected poultry will be killed by turning up the heat and shutting off ventilation systems. The US Department of Agriculture (USDA) said in a statement that it will consider this method only if there are no other ways to kill flocks within 24 hours of infections being detected. According to the agency, they want that the infected poultry should be killed within a day to prevent the virus from spreading to other parts. Almost 50 million chickens and turkeys died from bird flu or were culled from December through June in the country's worst animal disease outbreak on record. New Jersey's Department of Agriculture has stated that the emerald ash borer has been detected in the state's three counties - Somerset, Mercer and Burlington. In these counties, the population of high invasive type of beetle was found especially high in Hillsborough, Bridgewater, Ewing, West Windsor and Westamptom. Douglas H. Fisher, New Jersey's Secretary of Agriculture, said that with time, these insects are getting out of control. Therefore, there is a need to take steps against them. In New Jersey, the species was discovered in 2014. Since that time, the beetle has destroyed tens of millions of ash trees. The emerald ash borer beetle, around half an inch in length and one-eighth of an inch in width having green metallic color spread quite rapidly. For so many years, agricultural use of drones could not take place due to the lack of federal guidelines. Things are changing now, as since January, more than 50 exemptions have been approved by the Federal Aviation Administration for the farm-related operations. As per the Association for Unmanned Vehicle Systems International, agriculture could be held liable for commercial drone use. The drones are quite inexpensive and could take place of humans in a number of ways in large farms. They can transmit detailed information about crops and sprayers; they can be directed to problem spots and levying a cap on water and chemicals a farmer needs to use in those areas. In the past few weeks, Kansas has witnessed good amount of rainfall that has helped Kansas wheat crop recover at the time when season's harvest is approaching. It is said wheat cutting can start in parts of south-central Kansas soon. But Aaron Harries, marketing director for the industry group Kansas Wheat, said one of the important factors for cutting is it should be dry. Earlier this week, the US Department of Agriculture stated that 30% of Kansas's wheat crop is good or excellent condition. The department said that another 41% in fair shape and 29% is in a poor to very poor condition. On Tuesday, the Ohio Agriculture Department announced to cancel all live bird shows across Ohio this year to protect poultry from a deadly strain of avian flu. The ban includes poultry shows at the Ohio State Fair and all county and independent fairs across the state. The order also applies to poultry auctions, swap meets, and all other gatherings of birds for show or sale. This means there will be no exhibitors to illustrate poultry at the Hancock County Fair or at fairs in neighboring counties. The state officials are deliberating other options for 4-H and FFA exhibitors. California farmers have avoided the threat of deep mandatory cuts as the state has accepted their proposal to voluntarily reduce 25% consumption amid one of the worst droughts on record. California farmers hold some of the state's strongest water rights. Officials are hoping that the deal agreed upon on Friday is going to serve as a model for more such kind of agreements with growers in the nation's top-producing farm state, wherein agriculture is accounting for 80% of all the water drawn from rivers, streams and the ground. While announcing the agreement, Felicia Marcus, chairwoman of the state Water Resources Control Board, said that they’re in a drought unprecedented in their time, due to which they are required to take unprecedented action. According to Iowa's agriculture department, the highly pathogenic H5 avian flu found in first tests at five more farms in Iowa. It involves commercial egg operation that houses up to 5.5 million birds. Additional tests are in progress at a US Department of Agriculture laboratory. If the virus is confirmed at the farms in additional tests then there is a possibility that the total number of American cases might exceed 20 million birds and could also result in the biggest death toll in a bird flu outbreak in history of US. According to the US Department of Agriculture report released on Tuesday, the number of US poultry flocks infected with a deadly strain of bird flu has increase. Iowa has identified its first case and Minnesota has given the confirmation of eight more cases. Iowa has become the 12th state this year to find poultry infected with the H5N2 flu. The flu can kill nearly an entire flock within two days. In the last six weeks, twenty-two commercial turkey flocks in Minnesota have been infected with the H5N2 flu. Minnesota is the leading US turkey-producing state. According to Agriculture Department data, the number has accounted for over half of the 43 flocks that have been infected nationwide, since the beginning of the year. Beekeepers in Florida said that they need state funding and some help to maintain healthy population of honey bees. As per the Florida State Beekeepers Association, it needs $3.5 million for an apiary research center at the University of Florida. According to the state's beekeepers, honey bees play an important role in agriculture and the economy. The state is the third largest honey-producing state in the United States. Florida reported crop value of $22.7 million in 2013. About a decade ago, Florida had just 1,200 beekeepers, but now, the state in the southeastern region of the United States has approximately 3,500 beekeepers. The state's 400,000 honey-producing bee colonies face several kinds of threats including parasite called varroa mites. New Delhi: After oil, a cut in food subsidy is on the anvil as a high-level panel Wednesday suggested giving cash to beneficiaries and shifting rice and wheat procurement to states that do not have provisions for administered purchase price. 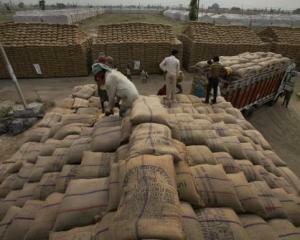 Food Corporation of India (FCI), the Union government's nodal agency for procurement and distribution of foodgrains, should focus on eastern states, leaving bulk purchase to state agencies in Punjab, Haryana, Andhra Pradesh, Chhattisgarh, Madhya Pradesh and Odisha, the panel suggested in its report submitted to Prime Minister Narendra Modi. New Delhi : With an aim to save standing kharif crops from weak monsoon, the Centre today announced 50 per cent diesel subsidy to farmers in places where rainfall deficiency was more than 50 per cent as on July 15. The 50 per cent subsidy will also be applicable to places as and when states declare them as drought-hit. New Delhi: Agricultural activists on Tuesday criticised a report of Intelligence Bureau for terming NGOs as a threat to India's economic security, especially with regard to genetically modified foods. "The IB report has a special section on GMOs (genetically modified/engineered organisms) that supports the introduction of GM crops into Indian agriculture. Sugar futures enjoyed a slight jump on Friday, a day after the government cleared a plan to provide interest-free loans to strolling sugar mills. On Thursday, the Cabinet Committee on Economic Affairs (CCEA) approved a plan to give interest-free loans of Rs 6,600 crore to sugar mills to enable them pay off cane arrears. The huge bailout package was cleared after most of the country's sugar mills expressed their inability to pay off soaring cane arrears. Queensland farmers affected by the drought are expected to receive support from the authorities in the form of land rent relief and transport subsidies for fodder and water. The government is offering more than $11 million in support to the farmers, who are facing difficult conditions due to the drought situation in the area. Premier Campbell Newman and Agriculture Minister John McVeigh visited Richmond located in the northwest of the state to declare a $11.2 million package to help farmers in 13 areas that are declared to be affected by the drought in western and northern parts of the state. It would not be possible for the world, especially countries like India that have limited resources and huge populations, to maintain food production without genetically modified (GM) crops technology, industry experts hinted. Ravi Khetrapal, regional director at Centre for Agricultural Bioscience International (CABI), said that a judicious use of plant biotechnology could enable farmers to grow more food on the same amount of land. He said that it was the use of higher yielding biotech crops that allowed the world to maintain food production between 1996 and 2010. The four year ban over the export of the non-basmati rice has finally been lifted by the Government. Besides, it has put a ban over the sales of onions overseas with the pursuit of meeting the challenges of surging prices. It has been reported that the onion prices have rose to Rs 25 per kg in just one year. India's monsoon billowed in the last week to deliver its highest weekly rainfall this season, reviving hopes of strong harvests in across the nation. Decent monsoon rains would also encourage India to lift a ban on exports of non-basmati rice and charging taxes on sugar imports. Monsoon rains is crucial for replenishing the farm output after last year's drought, which was 38 percent above normal in the week to July 28, from a 17-percent deficit in the previous week. 94 percent of the nation's corn has emerged in the field, as planting is completed, the U. S. Department of Agriculture has said. The corn crop, after a fast early half of the planting season, remains ahead of the five-year average, which lists corn as 91 percent emerged by this week of the year. While cotton planting is 91 percent completed, the soybean crop is 84 percent planted. Mitsui Mining & Smelting Co. said it lowered its zinc selling price by Y15,000 to Y205,000 a metric ton. This will bring the average zinc selling price for June to Y217,000. Zinc yesterday we have seen that market has moved -1.4%. Market has opened at 77.9 & made a low of 77.05 versus the day high of 78. The total volume for the day was at 1287 lots and the open interest was at 8955.Now support for the zinc is seen at 76.8 and below could see a test of 76.5. Resistance is now likely to be seen at 77.8, a move above could see prices testing 78.4. Zinc trading range is 76.5-78.4.